Environmental injustice can affect anyone, whether they are an African-American with asthma living in the South Side of Chicago or a low-income white family living near a toxic waste plant. But according to Jacqueline Patterson, director of the NAACP Environmental and Climate Justice Program, some are more affected than others. “While race is the number one indicator of environmental [injustices], we also know that racism and sexism and classism are inextricably tied,” Patterson said. 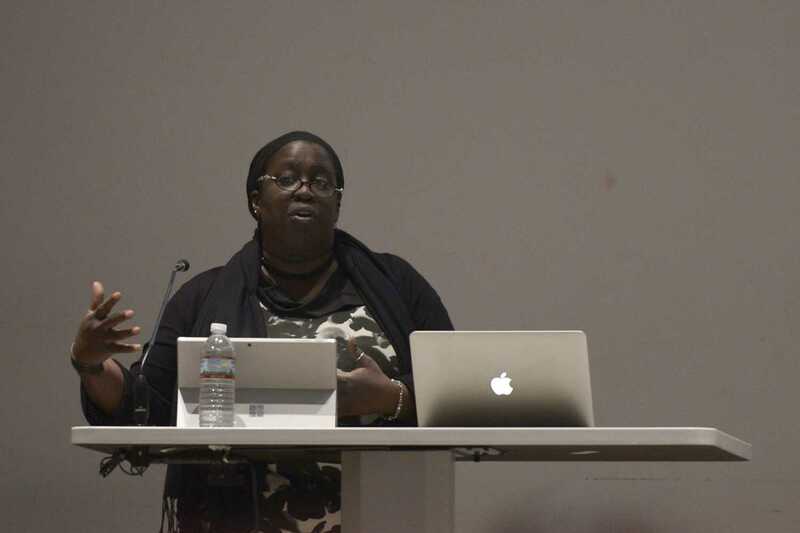 A crowd of about 80 people gathered Monday evening in the Frick Fine Arts auditorium to listen to Patterson speak at the Environmental Justice is Racial Justice is Gender Justice event. The talk was hosted by the Pitt Human Rights Initiative as a way to inform students and staff how minorities are often targeted when it comes to climate and environmental issues. Patterson cited the historical context of extracting natural resources and human rights with the country’s history of slavery, saying many people today are still stripped of their basic human rights or “the commons,” which include necessities like air, water, land, food and more. One of NAACP’s initiatives Patterson is involved in, called Lights Out in the Cold, aims to help those who are at risk of having their utilities disconnected. Patterson said there have also been incidents of people using generators for electricity but leaving them inside their houses, causing numerous carbon monoxide-related deaths. This is just one of the many examples of the injustices people who live near polluted and toxic infrastructures have suffered — Patterson said 68 percent of African-Americans live within 30 miles of a coal-fired power plant. She spoke about Annie Brown, a black woman from North Carolina, who lived near a coal-fired power plant and created a list of the health issues her neighbors experienced as a result. Patterson also emphasized that gender plays a role in environmental injustice. She cited the existence of “man camps,” energy company-built barracks in North Dakota where dozens of men live. Consequently, Patterson said there’s been a spike in missing Navajo women and human trafficking in these areas. And crimes against women occur in response to natural disasters, according to Patterson. Part of the reason why Patterson believes racism, classism, the patriarchy and climate change are interconnected is because the people who are making decisions, like those in Beaver County building an ethane cracker plant, are not part of these communities and are searching for profit. Patterson said there is often a lack of inclusion at important decision-making conferences, which leads to a violation of people’s human rights. She spoke from her own experience, when she was one of three black people in a room during a conference. Junior environmental studies major Young Sarah Grguras said she was particularly interested in this talk since she works in the Student Office of Sustainability. “We’re working on the way we approach sustainability and being more intersectional,” Grguras said. “I wouldn’t say that I’m well-versed in these issues, [so] I always like hearing new perspectives. Patterson wrapped up the talk with a quote from Martin Luther King Jr., ending with a message of hope for the audience.